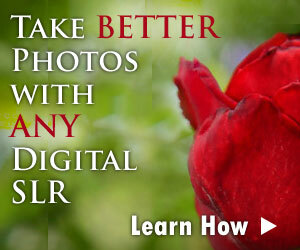 The best Canon digital SLR is - for me - the one that offers superior performance at a relatively reasonable price. This last part is important, since there are many other Canon digital SLRs designed for professional photographers that could be considered the "best". The only problem is that many of those cameras cost well over $2,000 USD. Since this web site is more for beginning and amateur photographers, the best Canon digital SLR that I've selected doesn't cost nearly as much. It's a good balance between the price you have to pay and the superior performance of the camera. 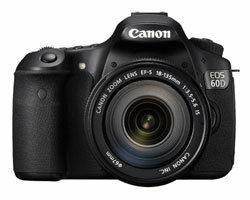 Currently, I think that the best Canon digital SLR is the EOS 60D (Release Date: October 2010). The 60D is part of Canon's line of "pro-sumer" cameras: these DSLRs are designed specifically for photographers who have some past DSLR experience and who are able to leverage the advanced features these cameras provide. The progression of Canon pro-sumer cameras includes the 20D, 30D, 40D, 50D and now the 60D. The early models of this camera line set themselves apart from the competition with very fast continuous capture speeds and fast, accurate autofocus systems. The 60D earns the best Canon digital SLR label because it also has these features...plus a whole LOT more. The 60D is the first Canon DSLR to include a flexible LCD screen that flips out from the camera body and rotates. While some will label this a "gimmick" feature, I find that it makes it MUCH easier to compose photos from odd angles: whether high above your head or from waist or even ground level. It also makes it easier to capture videos, since the 60D does have that ability. The quality of the LCD is exceptional: LCD screens with more dots are able to diaplay clearer, more colorful images and the 3 inch LCD on the 60D is made up of 1.04 million dots. A recent trend has developed in DSLR cameras to accomdate people who don't enjoy spending long hours in front of their computers. On DSLRs of old, you captured an image in camera...that was it. If you wanted to manipulate the colors, contrast or any other aspect of the image, you had to do that with a computer and specialized software. This is no longer true. Process RAW Files — RAW files are the uncompressed images captured by a camera's sensor (as opposed to JPG files). Since JPG is the universal image standard for web sites, if you want to upload images to online galleries or email them to friends you have to convert from RAW to JPG. The 60D lets you do this conversion in the camera. Resize — if you want to quickly share the 18 megapixel files captured by the 60D, you need to reduce their dimensions to make the files sizes smaller. The 60D can create smaller copies of a photo without affecting the original. Even though Canon wasn't the first to include video in a DSLR - that honor goes to the Nikon D90 - they have since jumped on the video bandwangon with enthusiasm. There are varying degrees of High Definition (HD) video that a DSLR can include: regular HD (also called 720p) or full HD (also called 1080p). The video captured by the EOS 60D is Full HD 1080, which can be captured at 24 frames per second. This is similar to the speed of film cameras and should make the quality of the video look more professional. When filming with the 60D, you have manual control over exposure and can adjust the audio level in 64 individual steps. This makes the 60D an appealing camera for budding videographers who don't have a ton of money to spend on professional camera gear. Before you run out and spend a lot of money on this camera you should ask yourself: do I really need the best digital SLR Canon has to offer? The 60D is not for everyone. If you're just getting started in the world of DSLR photography, the menus, buttons and custom features the 60D offers can be totally overwhelming. For the beginning photographer, a Canon digital Rebel is often a better choice. However, if you've used Canon DSLR cameras in the past OR if you're getting started on a career making independent films, then the 60D has a lot to offer.